Clary Fray's normal, quiet life takes a surprising turn one night when she witnesses a murder at the club Pandemonium. The only thing is, she's the only one who can see the killers and their victim. The next night, her mother disappears and her apartment is ransacked. It's then that Clary discovers that the killers she saw are really Shadowhunters, demon killers who live in secret. And the people she saw at Pandemonium, Jace, Isabelle, and Alec are the only one who can help her make sense of this strange new world of vampires, warlocks, werewolves, and demons, and help her find her mother. Cassandra Clare's writing is illuminating and imaginative, and her talent for building imaginary worlds remarkable. City of Bones is a weighty novel, but even the most reluctant of readers will find themselves swept away by the quick wit, fast thinking, and beguiling creatures. The book moves rapidly and seamlessly as Clary and her new friends move all across the city, uncovering hints as they go along and running into all sorts of trouble. The setting details really go a long ways towards making Clary's world more believable; Clare is constantly dropping names of landmarks and streets in and around New York City, as if the reader is actually there and is familiar with the city. The ending is exhilarating, with a twist you'll never see coming that will leave you eager for more. The past few weeks have been hectic for Clary Fray to say the least, and they only seem to get even more so in the sequel to Cassandra Clare's popular debut City of Bones. Clary's mother still hasn't awoken from her strange sleep induced by Jace and Clary's father, Valentine, and Jace is having troubles coming to terms with his true parentage. Things only get more complicated when an Inquisitor is sent to the Institute to question Jace's loyalty to the Clave, and he doesn't make a good impression. Suspicion is further aroused when children of magical descent are found dead all over the city, making everyone suspect that Valentine is up to something more sinister than they have anticipated. The second book in the Mortal Instruments series is full of fast paced action and twists and turns that you won't see coming. Clary gets more and more involved in the supernatural world as she and Jace struggle to accept their relationship, while at the same time fending off attacks from all sides. In between it all is exhilarating excitement, the awkwardness of being a teenager, and intriguing mysteries. 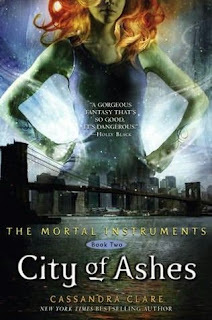 Readers looking for more breathless adventure and a spectacular battle against evil will delight in City of Ashes. Shadowhunters everywhere have been called to the city of Alicante in Idris so that the Clave may decide how to best defeat Valentine. Jace doesn't want Clary to come, fearing that her unnatural talent with runes may bring her unwanted attention. But when Clary manages to get to Idris on her own, illegally, to find the only person who can heal her mother, things start to get tense. Then something horrific happens, making it apparent that a traitor is among the Shadowhunters. Can Clary and Jace discover who it is, and how to work their strange powers before Valentine can take over? 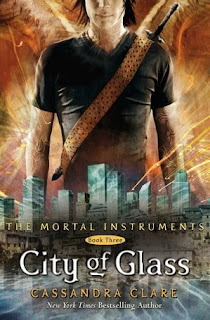 City of Glass starts off not long after City of Ashes ends, and switches points of view frequently between main characters so quickly it's almost hard to keep up and keep everything straight. But it doesn't take long before the pacing evens out once more, and the book glides along quite nicely. Cassandra Clare manages to fit in plenty of action-packed scenes and plot twists in this lengthy final book, and does a great job at building suspense throughout. It's not until more than halfway through that readers realize exactly how well thought out the Mortal Instruments series is, and Clare keeps them guessing until the surprising end. Full of romance, betrayals, dark secrets, and plenty of adventure, Clare's final book in the Mortal Instruments trilogy is the perfect, satisfying finish that won’t let go until the last page. What three words would you use to describe the Mortal Instruments trilogy? Long. I can't write short. You get a lot of bang for your buck with my books, page-number wise! I'd say they're also urban, and romantic. Wow, I don't know how to answer that without sounding like a jerk. I guess I would say that what I most often hear from readers is that they find the mixture of fantasy, action and humor unusual and they enjoy that. What supernatural book or work has influenced you and your writing the most? There isn't one book or work that has influenced me most, but rather I think I'm equally influenced by a number of different works. I can certainly point toward the urban fantasy of the eighties — the Borderlands books, the work of Charles de Lint and Emma Bull — and say, "I was influenced strongly by those." Flying. I hate driving, so if I could fly, I'd never be stuck in traffic again. What supernatural read are you itching to read next? I'm looking forward to getting my hands on Scott Westerfeld's Leviathan when it comes out in October. Love this series, thanks for the interview! I adore this series! Even though Harry Potter and Twilight have proved that teens read big books, it's still hard to find nice, thick reads. Thanks for the interview. 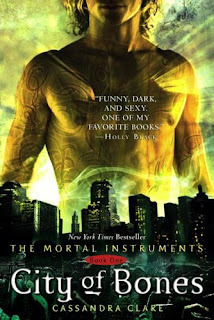 The Mortal Instruments was an awesome story! In fact, I'm rereading them right now. Thanks for the interview. I especially liked the last quesiton. It's nice to see what's she's looking to read right now.